No furry companions are harmed in the making of our creams. Finding a good under eye cream that was good for me, but that still performed well was certainly a challenge, which is why I was super happy to discover this product. The Alert cream is amazing for reducing puffiness, toning and firming, as it’s made with caffeine, botanical extracts and antioxidants that really breathe life into tired eyes. This Alert Cream is also amazing at lightening dark under eye circles! Containing Cucumber, Witch Hazel, and Niacinamide, black eyes be gone. Last but not least, the amazing oils in this under eye cream is what actually fights to reduce the appearance of fine lines and wrinkles. Made with Avocado, Arnica and Rosehip Seed oil, this unique blend of fatty acids do their best to diminish those pesky crows feet! And such an amazing eye cream. I've never been much into eye creams. Most of them are just too heavy and irritating for me. And yet, this one is a winner. The consistency is perfect. Not too heavy...It's one of the first eye creams I've used that has not caused me to experience milia. The ingredients are effective - including cucumber hydrosol, niacinimide and caffeine. Best of all... For all you #cleanbeauty lovers out there... It's safely calling your name. I keep mine in the fridge. I've been playing with the Alert Eye cream from @lalogy for the past several weeks and I must say, I'm thoroughly enjoying it. It has the scent of a sweet green tea and the rich, smooth texture of a mousse. Witch hazel & arnica work to naturally reduce inflammation while avocado oil smooths & detoxifies with vitamins A, B and E I mean, when is avocado a bad idea? Never! The delicate skin around my eyes can always use some TLC & I definitely found that in this jar! it's heaven in a jar!" If you haven't heard of lalogy yet, they are a luxury natural skincare line that definitely deserves your attention. I've been using "The Hangover" moisturizer and the "Alert" eye cream. They both leave my skin feeling silky smooth and glowing. The moisturizer has such a great texture, I love using it to prep my skin before applying makeup and it makes my skin look so good that I'm totally comfortable going foundation free. The fresh lemony scent is a great pick me up too. As for the "Alert" eye cream....it's heaven in a jar! Just a little dab of this stuff instantly brightens up my eye area and as I've been using this for over a month, I've noticed improvement in my fine lines and undereye circles. This line is definitely the "chanel" of all natural skincare and if you've been looking for luxurious products that are good for your skin and free from harsh chemicals and preservatives, this is the brand for you! If you've tried any of their other products I'd love to know, trying to decide which product to try next!" I fell in love with this brand! If you have acne prone skin and even some of the best organic oils break you out, you must try @lalogy! I struggled for so long to find a clean moisturizer that could heal my skin and give me similar benefits as the cold pressed oils in my favorite organic brands. I'm so happy to be using this line, and I know you will too. This has been my holy grail moisturizer for quite some time. This is an incredibly clean moisturizer that’s safe for acne prone skin and a great option for those who can’t use oils on their face! 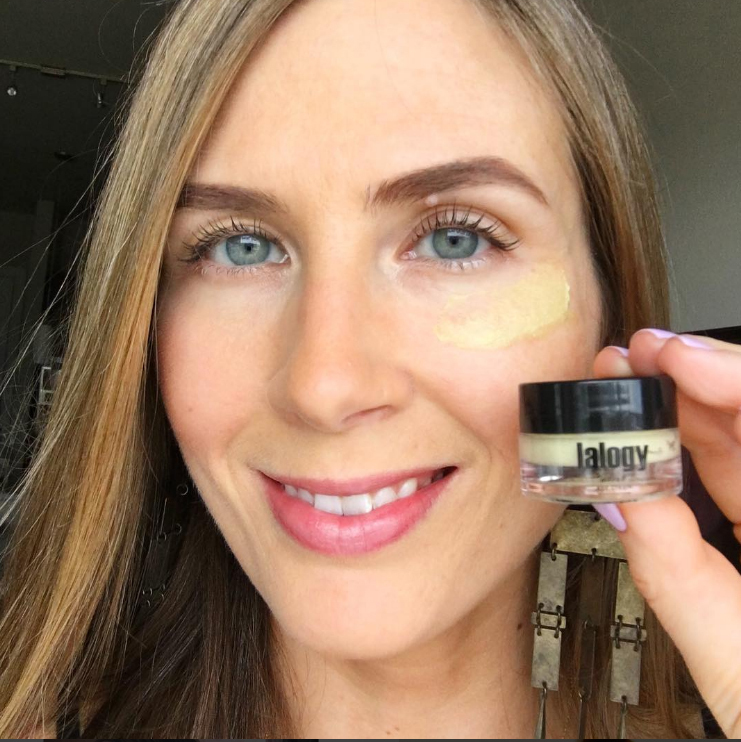 This Plant Based, All Natural, Vegan, & Cruelty Free Alert eye cream from @lalogy is the holy grail of eye creams, and that is not something that I say about just anything! First I'd like to tell you a bit about it before I tell you why I love it. It's a Matcha-Tea infused eye cream that uses Avocado Oil, Argan Oil, Cucumber Hydrosol & Vitamin B3 formulation to combat dark circles, hydrate dry skin, brighten, and reduces crows feet around your eyes all in one little jar. @lalogy every product they make is considered Alive & Fresh, and that's why refrigeration is recommended in all their products, not required, but you won't believe the results if you pop this baby in the fridge, and I'm talking cooling love here. Since I have been using Alert my under eyes have been brighter, my crows feet are diminished, but the thing that made me fall in love with this product is that it has tucked those bags up under my eyes dramatically in the small amount of time that I have used it to the point that I'm constantly looking in the mirror to see the improvement it has done!! That is what makes a product become a holy grail is when you can't stop looking at the magic it has done repeatedly, and that's exactly where I'm at now! I! would recommend this eye cream to everyone, but especially to those with aging eyes because this product will definitely change the way you see things, and I can honestly attest to that. Thank you @lalogy for creating an eye cream that took my under eyes to new levels, and I can't wait to see the results with extended use! I Absolutely Love this skincare line and all of their products that I've tried so far! About two weeks after I began using "Lalogy," I started receiving compliments from my friends and colleagues who were asking Me what I was doing? Not one week goes by without having someone mention how good I look! I love it, who wouldn't? I like knowing that what I'm using on my skin is all completely natural and free of harmful toxins. We can't turn back time, but we can choose to use quality products to feel our best for years to come. "After using The Hangover for a while, I saw such a big difference in my skin. I can honestly say my skin feels and looks softer and more smooth. Truly a first class face cream! "Lately I've been getting great results with my new skincare moisturizer from lalogy called "The Hangover" and eye cream "Alert" !This brand is amazing literally all the ingredients are Natural and Organic! These creams are so hydrating!! Great ingredients and work well!! Get yours today! My fav is the "hangover"
Was so excited to try out @lalogy Sunkissed daily moisturizer! It's infused with Green Tea Extract and vitamin E and B3 which helps delay the appearance of premature signs of aging, fine lines and wrinkles. My fave part about this #luxuryskincare company is everything is natural, organic and this cream smells good and is lightweight. "in love with the hangover"
“My skin and I are in love with The Hangover!! I have struggled with DRY skin for about 4 years now and noticed how it made me look older and not healthy. As a Makeup Artist my face is the first thing people look at so I needed something that truly worked and wasn’t going to break me out. Now going on 38! I am not ready to look 38. Love when a moisturizer does what it promises to do. This non-greasy formula leaves behind a Beautiful glow to the skin. I must admit I love creams over oils since my skin doesn't react to creams as much even though they may contain some essential oils. I wear it under my makeup and at night before going to bed so I can wake up looking refreshed and glowing?? Ps-- The Hangover lives in my refrigerator which is even better for me since the hot summer days are on the way!